I have been busy renovating a house for the last year (still not finished) that has reduced gaming time. I also ran into a roadblock with the continued development of my own rules – Ancient Battlelines Clash (ABC) – designed for fast play ancient battles on 2'x2′ tables. Late in 2017 I created a mashup of the at that time version of ABC and a gridded variant of Bill Banks Ancients I had used for replaying battles from the board game Imperator. I played a game of the Battle of Heraclea around January 2018. The rules played fine at resolving issues I had with ABC but went a step to far in streamlining. I looked at my draft blog post around Christmas and realised not only had I drafted a few notes, I had written the battle report, cropped the images and all I had to do was a bit of tidying up and I could post the report. 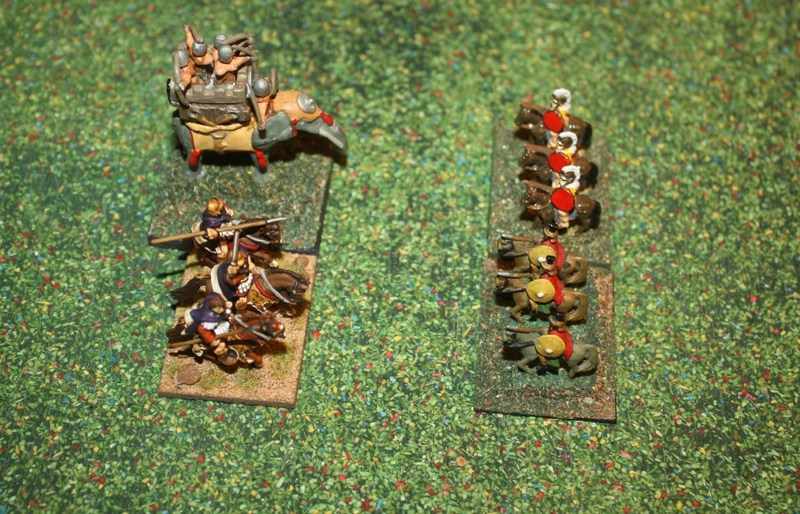 I have done so and on the blog is a battle report for Heraclea using the mashup rules. It also has a fair bit of detail on the mashup rules, a link to the mashup rules (that I am unlikely to continue developing). Completing the battle report has spurred me to complete drafting the next version on Ancient Battlelines Clash that is now nearly done. Hopefully will post the rules early this year and also play a few games with them.